Canadians Rally Around Retaliatory Tariffs Aimed At The U.S. Among the items targeted in retaliatory tariffs: ketchup, powerboats, dishwashing liquid, steel and aluminum. And gherkins. Canadian businesses have flooded a Canadian pickle business with new orders. 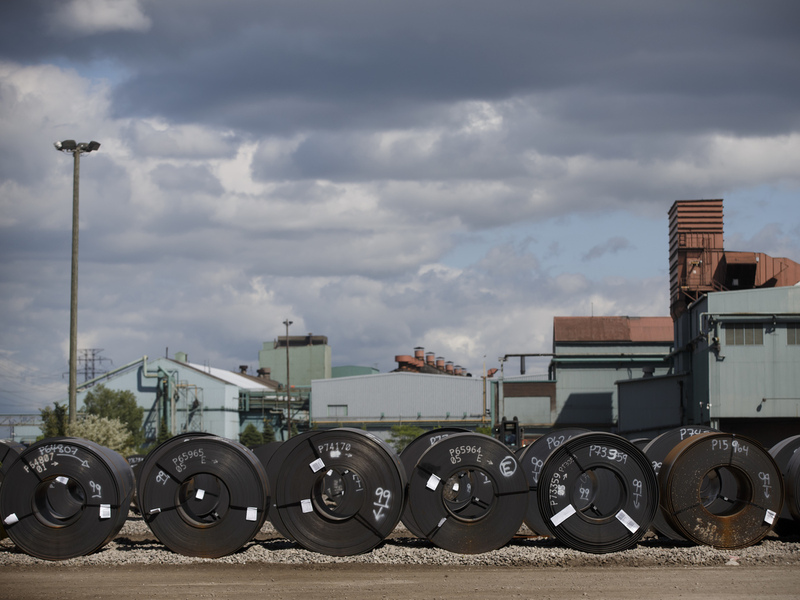 Steel coils lay in a yard at the ArcelorMittal Dofasco steel plant in Hamilton, Canada. President Trump recently announced tariffs on Canadian steel and aluminum imports. Lakeside Packing is a small, family-run pickle and condiment business in Harrow, Ontario — a speck of a town close to the U.S.-Canada border. Woodbridge says his is one of the last pickle-packing companies in the country, doing just over a million Canadian dollars ($761,125) a year in sales. It's very likely that will pick up, since Canada says it will impose retaliatory tariffs on the U.S. on July 1. On the long list of items to be targeted are gherkins, a popular pickled treat in Canada, and one that Woodbridge produces at his plant. 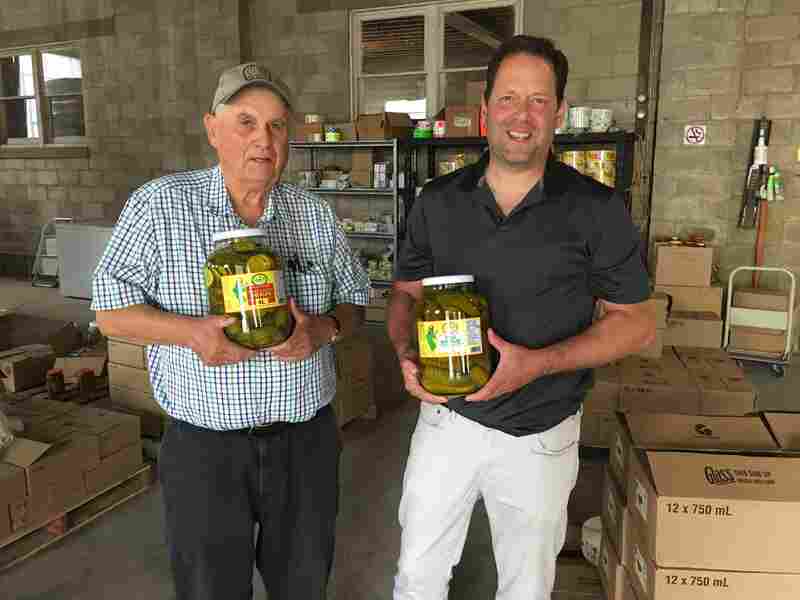 Don Woodbridge (left) and son Alan Woodbridge hold jars of pickles at their company in Harrow, Ontario. Orders are up in anticipation of retaliatory Canadian tariffs on U.S. gherkins. Woodbridge says he heard about the possibility of retaliatory tariffs on the television news shortly after President Trump imposed tariffs on Canadian steel and aluminum, citing U.S. national security concerns. "I was sitting in my La-Z-Boy chair and, you know, they were talking about Trump," he says. When the TV reporter said Canada would retaliate by slapping tariffs on U.S. products, "I went down the list, and they said gherkins. I couldn't believe it, you know ... I started laughing." Woodbridge says he is being flooded with calls from local grocery stores and restaurants, trying to lock in supplies because the cost of U.S. pickled products is due to go up when Canada imposes its nearly $13 billion of retaliatory tariffs on U.S. products. Food and consumer items — everything from dishwashing liquid and powerboats to yogurt, ketchup and whiskey — will face 10 percent tariffs. A 25 percent tariff will also be placed on any American steel and aluminum. Darren Green, the president of the Hamilton Steelworkers Area Council in Hamilton, Ontario, was angry when President Trump placed tariffs on Canadian aluminum and steel, and backs Prime Minster Justin Trudeau's decision to go ahead with retaliatory tariffs. "We've got no choice. We just can't accept that that behavior, the bullying, from somebody that is going to affect our country, our jobs, our families' livelihoods on a whim," he says. Green says the whole situation is unnecessary and destructive. 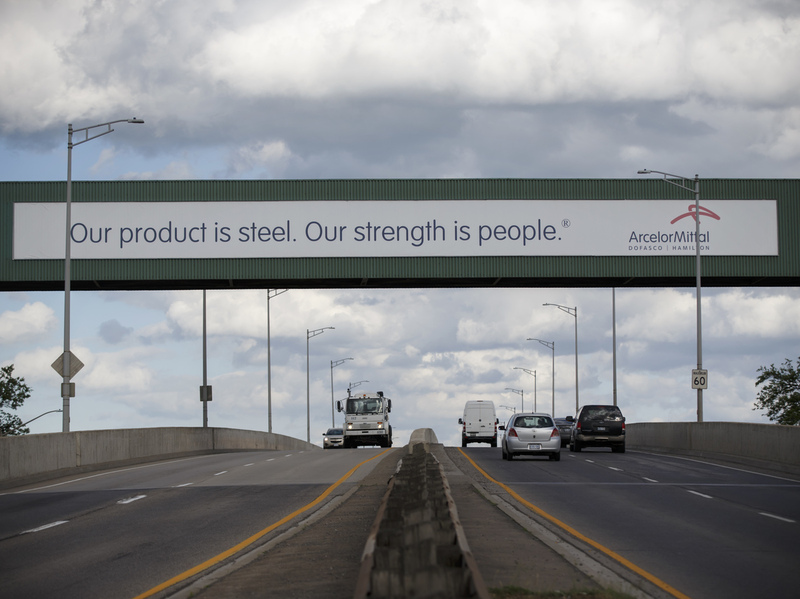 A banner adorns an overpass at ArcelorMittal Dofasco's steel plant in Hamilton, Ontario. "We were producing more steel now than we have, probably, I would say, in the last 20 to 30 years," he says. Both countries should be celebrating the success of their industries, he says. "But we're not — we're going to tear each other down and we're going to destroy families, we're going to destroy an industry," he says. "It makes no sense." The Canadian tariffs are designed to hit products like steel and bourbon from states like Ohio and Kentucky that heavily favored Trump in the presidential election. The Canadian government plans to keep them in place until the U.S. removes its tariffs. The Canadian Steel Producers Association says the U.S. and Canada exported roughly the same amount of steel to each other in 2016. It's part of a tightly integrated cross-border trade network worth about $2 billion every day. President Trump says Canada has unfair trade policies and a huge trade surplus with the U.S. But the U.S. has a surplus with Canada. "Official U.S. government statistics show that the U.S. is in a small surplus with Canada," says Gordon Ritchie, who served as Canada's ambassador for trade negotiations in the 1980s. "It's largely balanced trade and so it's fair trade and it's free trade. Or it was, until Mr. Trump started applying bizarre restrictions, tariffs under the guise of national security, which is, of course, ludicrous." There are concerns that the two neighbors could get embroiled in a trade war. Canada is a small economy and relies on its trade with the U.S. But businesses could start relocating to the U.S. if the standoff becomes protracted. Ritchie says there will be an impact from both countries' imposition of tariffs but Canada will be just fine. "It's not going to be the end of the world for Canada. We have quite a strong economy, we have a lot on offer and we have alternative markets for a lot of things," he says. Canada has been pursuing trade deals with other nations, and is staying well connected with political and business networks in the U.S. Paul Moen, an international trade lawyer at Earnscliffe Strategy Group in Ottawa, says the Canadian government has also promised to step in to help industries like dairy and steel. "The prime minister and the government have been very diligent about meeting with groups that could be impacted by trade," he says, "reassuring them that in the event that there is a major impact, there will be either trade actions or other types of relief provided." Roland Paris, a professor of international affairs at the University of Ottawa and a former foreign policy advisor to Trudeau, says no one wins in a trade war that could cost tens of thousands of jobs. Paris says it's a sobering moment in Canada-U.S. relations. "We make stuff together," he says, "we're the closest two countries in the world. There's no reason why we shouldn't continue to work closely together to grow our own and each other's economies." So far, Trudeau's move to impose retaliatory tariffs has the backing of the Canadian people. But the economy could be hit hard if Trump ups the ante and makes good on a threat to slap tariffs on automobiles — one of Canada's most important industries.